Two drawings in SM Adam volume 12 are plans for the ceiling of 'the Anti room at Ashburnham House'. 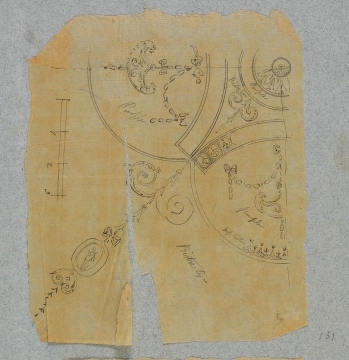 Drawing 125 is dated 10 April 1773 and is further inscribed 'not a correct Copy' meaning that it is a preliminary design without the colour washes and elaboration of drawing 126. This last is closer to the tracing catalogued here but with variations in, for example, the bow motif and while purple and bistre are noted on the tracing, in the finished drawing (126) the main colours are olive green and a light pink with some bright and light blues. Drawings and tracing are to the same scale. See also 42/56 for a tracing of a drawing for the ceiling of the library at Ashburnham House dated 25 July 1773Ashburnham House, 19 (later 30) Dover Street, London was altered for the 2nd Earl of Ashburnham, 1773-6 by Robert Adam and since demolished (Colvin, 1995).